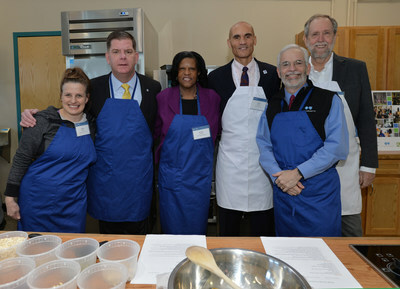 BOSTON, Feb. 5, 2018 /PRNewswire-USNewswire/ -- Today, Boston Mayor Martin J. Walsh joined Andrew Dreyfus, president and CEO of Blue Cross Blue Shield of Massachusetts ("Blue Cross"), to celebrate the launch of Dot Rx, a prescription-based program that connects Dorchester families with peer health coaches and local experiences that promote healthy living - including opportunities to eat healthy, get outside, and be active. Developed by Blue Cross in collaboration with Codman Square Health Center, Daily Table, the Dorchester YMCA, Healthworks Community Fitness, Outdoors Rx, a program of the Appalachian Mountain Club, and Union Capital Boston, Dot Rx is the first prescription-based program of its kind where a health insurance company, community health center, and multiple nonprofits have come together to engage families in a holistic approach to health and wellness. Through Dot Rx, clinicians at Codman Square Health Center refer families to meet with peer coaches to discuss their health challenges and set goals around eating, exercise, and engaging with the outdoors. Based on the families' unique goals, the peer coach then connects them with free or reduced rate opportunities and resources available through the five nonprofits in their community. In its pilot stage, Dot Rx is engaging approximately 100 Dorchester families, with the hope that the model can be replicated in communities across Massachusetts. 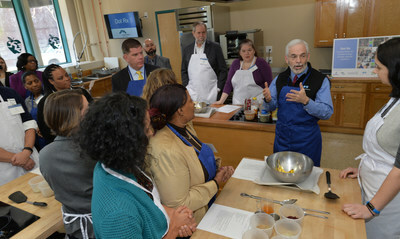 "Blue Cross is committed to helping all Massachusetts residents lead healthy lives and this collaboration is just one way we are testing innovative ideas to address and improve the health of our communities," said Dreyfus. In addition to guiding the development of the Dot Rx program model, Blue Cross has committed $1 million over two years in financial grants and pro-bono consulting from Blue Cross employees to lead the systems development, financial modeling, and program evaluation. "We think this collaborative model is an innovative way for companies to leverage their expertise and resources and partner with local nonprofits to bring about real social change in Boston and hopefully beyond." "This partnership with Blue Cross has allowed us to provide our patients at risk for serious health issues the opportunity to receive personalized support to enable healthy behavior changes," said Sandra Cotterell, CEO of Codman Square Health Center. "Healthy living goes beyond the medical setting – providing patients with the resources to improve their health and quality of life through healthy cooking classes, fitness classes, and group nature walks is just as important." Codman Square Health Center was founded in 1979 by a group of community visionaries seeking to restore their neighborhood on the brink of disaster. Today, with a staff of over 300 employees and an astounding depth and breadth of community programs and partnerships, the Health Center serves as a resource for improving the physical, mental and social well-being of the community. Serving over 22,000 patients each year, our comprehensive, integrated services build upon a Patient-Centered Medical Home model and include primary care, urgent care, dental care, eye care, behavioral health, and nutrition. For more information, visit www.codman.org.